Annuals compress their life cycles and go dormant as conditions grow unfavorable. Sudden carpets of wildflowers mark their waking from dormancy as seeds, like time travelers, quickly germinate, flower, and renew their species before before seasonal moisture dries up once again. Patient perennials ply an alternate strategy: Joshua trees flourish in moist periods, then bide their time in long dry periods. Many animals get their energy by eating plants, but desert plants give up the fruit of their production very reluctantly. Sharp spines and chemical-laden leaves discourage plant-eaters. 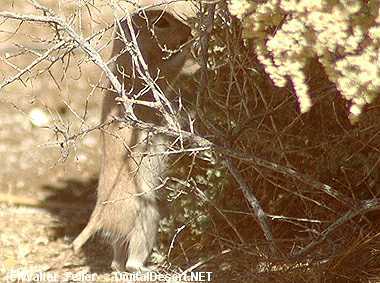 The kangaroo rat avoids these obstacles by eating seeds that, while safe to eat, can be hard to find. Many are small and look like grains of sand. With sensitive front paws a kangaroo rat sifts sand to find seeds by touch, eats them and transforms them into animal tissue. 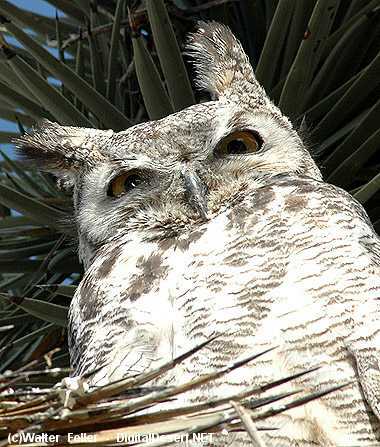 The plant's solar energy flows through the ecosystem as kangaroo rats, and other herbivores like jackrabbits, fall prey to carnivores like great horned owls, coyotes, bobcats or snakes. A large, productive plant like the Joshua tree is the focal point for a complex community of wildlife. Some birds nest in the living tree. Others feed on the resident insects. Discarded limbs or the tree's toppled body provide homes for the yucca night lizard and termites. 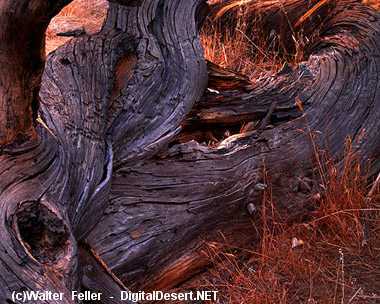 Even in death, the Joshua tree's stored solar energy is is converted by termites into animal tissue. Yucca night lizards may then eat the termites but fall prey themselves to an owl or snake. As the Joshua tree continues to decompose, stinkbugs may nibble on their home! And so the Sun's energy keeps moving through the fascinating life of the desert. There are two types of desert within Joshua Tree National Park: the Mojave and the Colorado. In fact, some ecologists say the park is a transition zone between the two. As you go from Twentynine Palms to the South Entrance, you begin to see Joshua trees at the 3,000-foot elevation level. Joshua trees indicate the Mojave Desert. 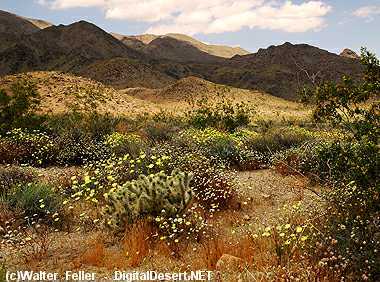 In the Pinto Basin, plants of the Colorado Desert appear: Bigelow (jumping) cholla and ocotillo. South of the Cottonwood Visitor Center even more distinctive Colorado Desert plants include palo verde, chuparosa, and ironwood. Nearly three quarters of these parklands have been designated by Congress for permanent protection as wilderness, The park's highest value lies in these landscapes -- vast stretches of arid landforms, vistas, and desert habitat that offer open space, refuge, and recreation for southern California's teeming population, visitors from the U.S. and the rest of the world.